The cricket world cup 2011 is going to start from 19th February 2011; and every Indian is eyeing on the performance of Indian Cricket Team. Sachin Tendulkar, the Cricket God, might be playing his last world cup – and most of cricket fans are expecting to nurture their eyes by witnessing the magic of Sachin Tendulkar on the Cricket ground. Well, let us see what planets are indicating for Sachin Tendulkar as per Vedic Astrology. In vedic astrology horoscope of Sachin, the ascendant lord Mercury is debilitated in seventh house. The fourth house is occupied by Rahu and the Moon which is fairly good for financial matters. And, it is due to this reason; the whole Mahadasa of Rahu remained quite favorable and strong for overall matters in Sachin’s life. The fifth house is occupied by Jupiter and Mars of which Mars is exalted while the Jupiter gets weak. The eighth house is occupied by Venus and exalted Sun. The placement of Saturn in ninth house is fairly good in terms of matters related with luck and fortune. Sachin Tendulkar is currently under Mahadasa of Rahu and antardasa of the Sun till September 2011. As such, the Sun is exalted and conjunct with favorable Venus in natal birth chart, and as per vedic astrology the antardasa of Sun is likely to give positive results. However, the placement of the Sun in the eighth house is not completely auspicious in the light of vedic astrology; and this may cause minor but frequent obstructions in the endeavors of Sachin Tendulkar. The transit of Sun, Venus, Mars and Mercury is to be closely watched and analyzed to judge the expected performance of Sachin Tendulkar in the Cricket World Cup 2011. On 19 February 2011, the first match of Indian Cricket Team is falling on Saturday. Sachin Tendulkar will be having three planets viz. the Sun, Mars and Mercury in sixth house of his horoscope. The Moon will be transiting in Leo zodiac sign in twelfth house. Although, placement of cruel malefic planets in sixth house is said to be quite favorable in vedic astrology. But the involvement of Mercury, as a lagan lord, is denoting negative results in terms of sports and health. Therefore, the chances of Sachin Tendulkar performing good are very meek. He may encounter bad luck and injuries on this day. The combust Mercury and twelfth house Moon may cause him to lack focus and he may become overconfident. Overall performance of Sachin Tendulkar, on the basis of vedic astrology, may not be up to the mark on this day and he may find it difficult to sustain on the batting crease. On 27 February 2011, Sunday, things are appearing very critical for Sachin Tendulkar. Around 11.05 AM, the transit Jupiter will be shifting to Scorpio Navamsha. 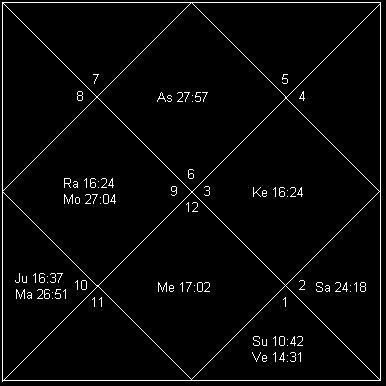 In natal birth chart of Sachin Tendulkar, Jupiter is debilated and conjuct with Mars. This change of Jupiter may generate sudden emotional imbalance and nervousness in his attitude after 11.05 AM. This impact may be more pronounced as such Venus is also transiting over natal Jupiter and Mars in the fifth house. Sachin Tendulkar may get tempted for taking risk under pressure. If he get chance of batting before 11.05 AM, the performance will be averagely good as per vedic astrology. On 6 March 2011, Sunday – India will be playing against Ireland. Sachin Tendulkar will be having the same planetary placement of the Sun, Mars and Mercury in transit. The Moon will be conjunct with transit Jupiter in Pisces sign. The Mercury will be changing its transit sign to Pisces around 8.25 PM. As it will be a day-night match, India batting in the second half will be quite suitable for Sachin Tendulkar and he can give some good treat to his fans. Overall, vedic astrology predictions for Sachin Tendulkar are strong and he is likely to perform reasonably well in comparison to past two matches played by him. On 9th March 2011, Wednesday – India will be playing against Netherlands. And, this will also be a day-night cricket match. The transit Mercury will be debilitated, combust and conjunct with Jupiter in the seventh house. The Venus will be in fifth while the Moon will be transiting in Aries zodiac in eighth house of Sachin Tendulkar horoscope. The transit of Sun and Mars from sixth house may give some good strength. Vedic astrology predictions for Sachin suggest that he may remain quite active and strong during the match; and his performance will be fairly good. He would like to stay on the pitch and generate some new records by scoring good runs. On 12 March 2011, Saturday – India will be playing against South Africa in day night match. And, besides Sachin Tendulkar – every other player of Indian Cricket Team may remain under tremendous pressure to perform. The Moon will be transiting in its exaltation sign Taurus in the ninth house of Sachin Tendulkar horoscope. And, Sachin is also likely to perform exceptionally well during the day. Vedic astrology readings are indicating that his contribution will be significant in overall matters including batting, bowling and fielding. 20 March 2011, Sunday – India will be playing against West Indies in day night match. Transit Mercury will be out of combustion on this day. But the Sun, Jupiter will be transiting in the seventh house along with Mercury. The Moon will be transiting in ascendant itself. The strong Sun and Moon are likely to give Sachin Tendulkar a good start and he may like to remain aggressive and dominant in the field. The Mars alone will be in sixth house which may generate bad luck for Sachin. He may suffer from bad decisions and lack of support/understanding from his counterpart during batting on the pitch. Vedic astrology prediction for Sachin is suggesting that he will be par excellence during the day – though bad luck and misunderstanding on the ground may obstruct him to give his best for the Indian Cricket Team. guruji u r 100 % correct. in todays match against SA, except for sachin no one played well. india lost the match when sachin got out after brilliant century..no other member in the team also did not perform well..